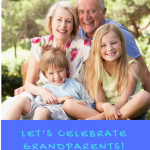 National Grandparents Day is celebrated the Sunday following Labor Day each year. Marian McQuade made it her mission to educate young people about the contributions of seniors and their importance in the community. She encouraged young people to adopt a grandparent, not just to celebrate the day, but for their lifetime. By 1978, led by Senators Randolph and Byrd, a resolution was passed by Congress and the proclamation signed by President Jimmy Carter. Marian knew what she was talking about. She had 15 children and 43 grandchildren! Grandparenting, as a lifestage, stands out as the most positive transition in later life. If you examine the lifestages that occur after the age of fifty, most have to do with loss. Many grandparents see it as a continuation of their lives and families, even after they are gone. Others see it as a “do-over.” As busy parents they may have spent less time than they wanted with their children, but as grandparents they are available and happy to be with their children’s children. Now that the Baby Boom generation is becoming grandparents, the sheer size of the market is compelling. There are more than 100 million people over the age of fifty. By 2020, 80 million older adults will be grandparents. That is one in three US adults will be in this lifestage. For marketers the grandparenting lifestage represents a huge opportunity. First, marketers have to overcome outdated stereotypes of grandmothers with buns and rolling pins, or granddads in rockers. With $400 billion in spending on goods and services, adults 55+ are outspending younger consumers two to one online. Becoming a first-time grandparent is a huge trigger for spending. Recent studies, however, show that spending remains consistent as a grandchild ages. This has been more true since the recession and the gradual recovery. Where once grandparents helped with “extras” like trips, cars and education, more than half report helping their adult children with the expenses of everyday life – tuition, clothing, insurance and more. As we celebrate grandparents the social impact of having older adults in the lives of children is undeniable. Margaret Mead said, “Somehow we have to get older people back close to growing children if we are to restore a sense of community, a knowledge of the past, and a sense of the future.” Now it is time to recognize the financial contributions as well and respect their role as dynamic consumers across nearly product category. To learn more about today’s grandparents and their role in lives of their families, get your copy of The Grandparent Economy, available now on amazon.com.